As someone who is interested in using boron-containing molecules as biological probes, I do not like seeing cases in which boron plays second fiddle… I refer to the applications that build on the known propensity of organoboron compounds to undergo oxidation. While this is good from the standpoint of benign metabolism (after all, boric acid is fairly innocent and compares to table salt in terms of toxicity), I cringe when I think about what might prematurely happen to those boron-bearing molecules that are supposed to derive their effect from a productive protein/boron interaction. Take, for instance, the prodrug approach recently reported in JACS by Kim and co-workers. This nice chemistry hinges upon hydrogen peroxide-mediated boronate oxidation. 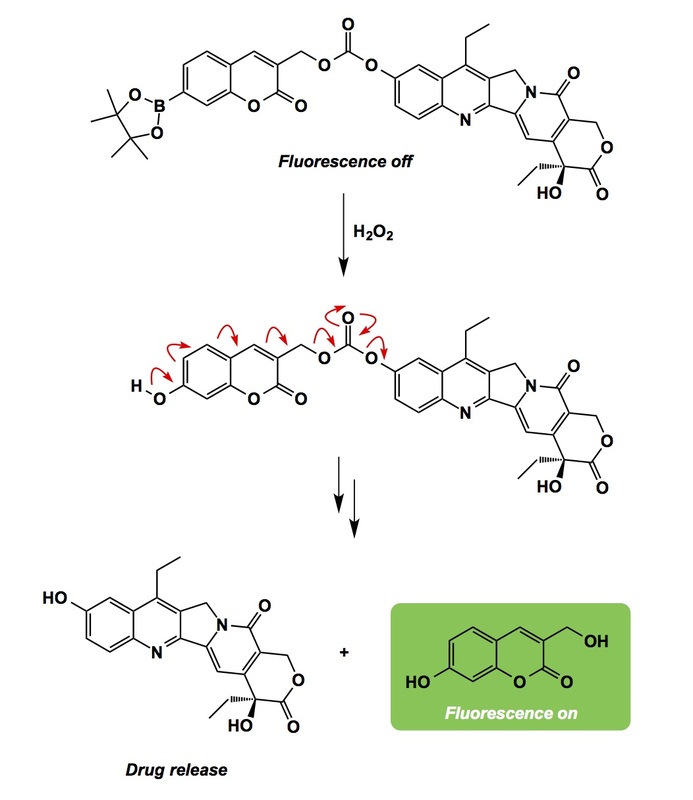 As a result, a fluorescent molecule of coumarin is produced along with the release of camptothecin. This application builds on the fact that cancer cells tend to overproduce reactive oxygen species (ROS) such as hydrogen peroxide. The latter selectively react with the boronate moiety on the camptothecin-containing prodrug. In cellular experiments, the carbonate prodrug shown below delivered fluorescent signal localized in lysosomes, confirming cellular delivery of the therapeutic agent. While this example is really nice, we need to watch out for the unintended and premature destruction of C-B bonds in the molecules we are building.